Feast at Round Hill has long been a favorite venue for so many reasons. Brides who don’t want a wedding factory will be happy to hear they host only one wedding per day. The warm, intimate indoor spaces lend to a feeling that you are inviting guests to a private home for the day. Fireplaces in several rooms contribute to the cozy environment. The hardwood floors, original moldings, and mahogany bar are all tasteful and draw one in. The luxurious gardens have over 100 varieties of flowers and plants. There are fountains, a pond, and several winding paths to explore. The outdoor ceremony space offers a choice of several natural backgrounds. You can change the direction depending on the time of day and which direction you want for the sun. Over 200 guests can be seated in the dining room. French doors will beckon your guests to the 1600 square foot dance floor. The dance space can also be easily converted to an indoor ceremony space if weather requires or for winter weddings. I love this photo because it was a natural, expressive moment. 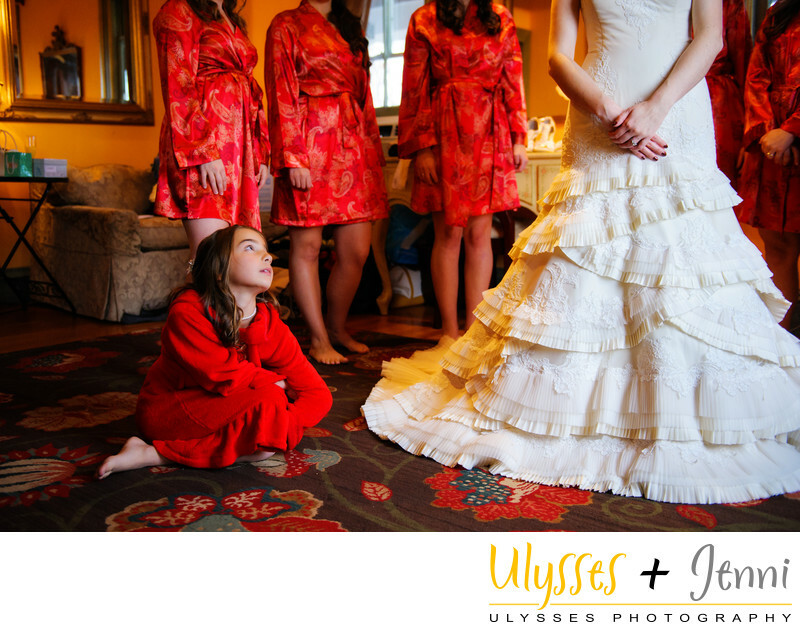 You can almost hear the thoughts of the flower girl as she gazes up at the bride. Her dreamy countenance says volumes. I also love how the ruffles in her robe are echoed in the ruffles of the bride’s lacy dress. The red bridesmaids robes were gifts from the bride. I love how their color is repeated in the warm tones of the rug. The framing of the image also adds to the appeal for me. All the focus is centered on this sweet girl and her daydream of being a bride some day. This Gatsby-inspired wedding was full of personal touches. The DIY broach bouquet was handmade by the bride and her grandmother, inspired by the rich colors of autumn. It was just the right touch for her crisp November wedding. A vintage Samsonite suitcase for cards lent to the Gatsby mood. After receiving their custom designed album, this couple wrote us the sweetest note. They said:"We just could not have asked for a better duo to photograph our wedding day." We think everyone deserves to feel this way about their choice. We have photographed numerous Round Hill weddings at Round Hill House. We know both the indoor and outdoor spaces and how to make the best use of them. But most importantly, we will help you look your best in your photos. We will also help you relax and enjoy your day to the full.